I feel that this new website came at the perfect time. I have done a workshop with Ruth Walter and Rentia Coetzee a month ago which really moved boundaries for me. I went to the workshop with the goal of learning more about colour, lost edges and and interpretation instead of tightly rendering. 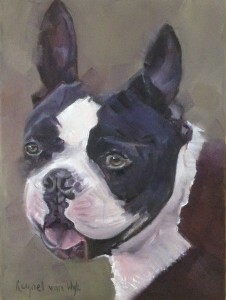 This painting of Bakkies, a loveable Boston Terrier, shows an improvement on my earlier works in all those areas. Click here to go to my available paintings.